Another year and lots of food. The past year of blogging has been very different from the year before, mostly in quantity. As most of you have probably noticed, frequency has tapered off a bit. For a while I was doing a lot of writing that was not here on Brooklyn Locavore. Some for Restaurant Girl and a bit of editing and writing for Just Food. Then I started a new full-time position in December. Work life has been crazy, good crazy, but forced me to scale back a little. I’ve continued with Just Food, took a break from Restaurant Girl but ideally would love to be posting here twice a week. I still cook almost as much and am at the point that I probably have more recipes and ideas to share than I’ll ever be able to write. It’s also been a slower year of engagement. With full control of my schedule, I was able to meet new bloggers, engage online and off-line whenever and wherever I wanted, but now things are more restrictive. I’ve only been to ONE BK Swappers gathering this year, but have tons of tons of goods to share. UNACCEPTABLE. There’s no arguing blogging takes time and commitment. Any blogger will tell you that. And for those of you out there with full-time jobs, blogging regularly and managing a family—kudos to you! You’re a better person than me. Commitment I have; the time part is still what I strive to balance. Hopefully through reflection I’ll be able to prioritize and get back to a normal schedule. Whatever that even is. But for now, let’s just celebrate. Another year of blogging, another year of life, and many years ahead to figure it all out. MAKE THE PANNA COTTA: In a medium bowl, mix together milk, gelatin and scraped vanilla bean. Let gelatin bloom, about 10 minutes. In a small saucepan, combine heavy cream and sugar. Place over medium heat and bring to a simmer. Remove from heat and stir in gelatin mixture until gelatin melts. Transfer mixture to a large bowl and stir in yogurt until smooth. Divide among ramekins or bowls. Transfer to refrigerator and chill until set, at least 2 hours and up to overnight. MAKE THE TOPPING: In a medium bowl, mix together strawberries and honey. Let sit at room temperature for 2 hours to draw out the juices. 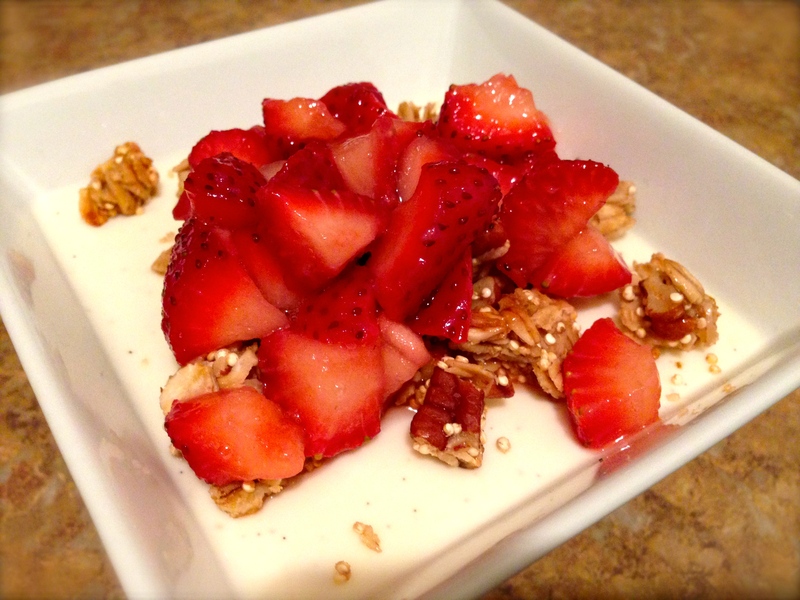 TO SERVE: Sprinkle each Panna Cotta dish with about 1/8 cup granola. Spoon over strawberries and juices. Serve immediately. Aww, thanks so much for the kind words! You are welcome from across the ocean! I know. 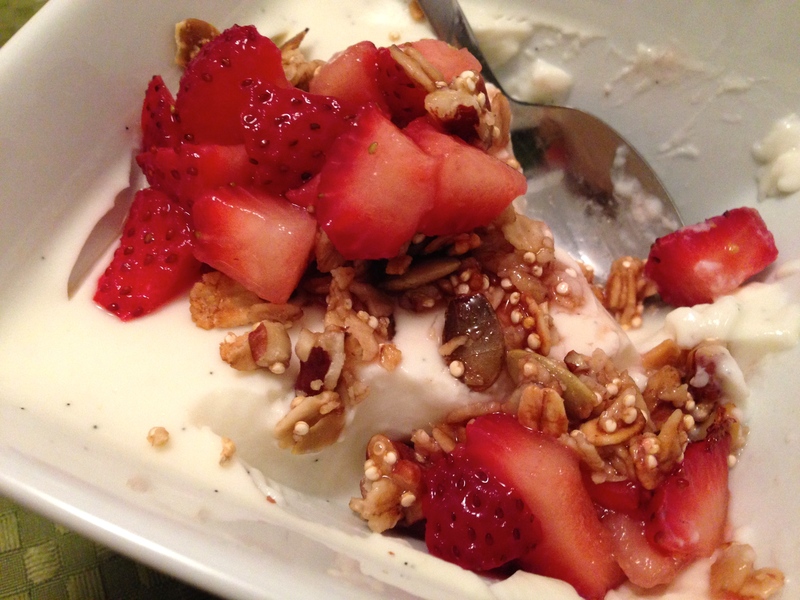 My friend tried to convince me that panna cotta was easy but it didn’t seem possible. Although, if you want to unmold them, that’s certainly a bit trickier. I went through 8 and got one that was so so. Apparently, the best way to make it (or anything with gelatin) is to use the sheets rather than powder, but I’m not sure where to get them. Cake or baking store I guess.